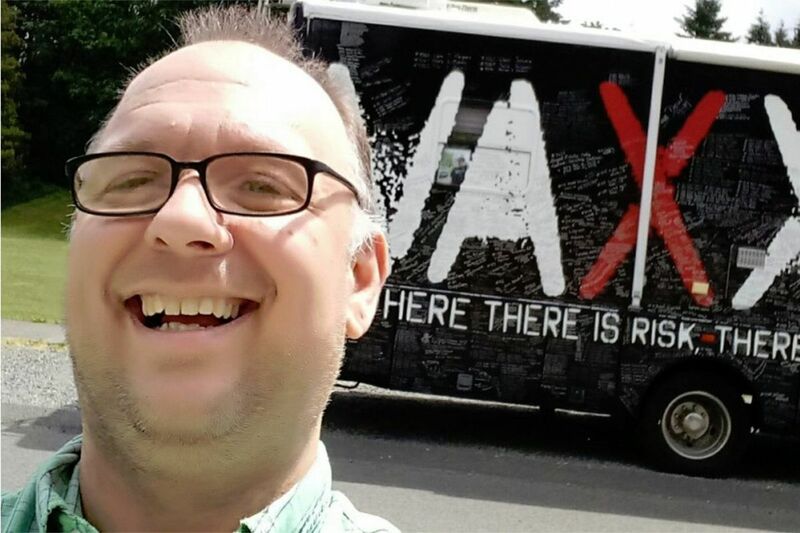 Craig Egan, an Uber driver from Tacoma, Wash., has driven cross country this year to disrupt a bus tour launched by a group that questions the safety of vaccines. Craig Egan drove across the country this summer to disrupt a bus tour launched by the makers of the film Vaxxed, a group that questions the safety of vaccines. He marched with a sign. He spoke through a bullhorn. He documented his public-health crusade on YouTube, and was labeled a "troll" in response. This week, the tech salesman-turned-Uber driver came to Children's Hospital of Philadelphia in search of a friendlier audience: vaccine inventor Paul Offit. "He's a hero," Egan said after meeting the physician for lunch Wednesday. Craig Egan describes his cross-country, pro-vaccine journey to Paul Offit (left), director of the Vaccine Education Center at Children’s Hospital of Philadelphia, as Egan’s girlfriend Sharon Schroeder looks on. Egan and Offit are waging the same battle through different means. Offit developed a vaccine for rotavirus that has saved hundreds of thousands of lives since its approval in 2006. The disease causes severe diarrhea and vomiting, and is often fatal in developing countries with a shortage of clean water. Today, he is director of CHOP's vaccine education center, patiently fielding calls from parents with questions about the two dozen shots that are recommended for children by age 2. Egan, 42, is more of a provocateur, shadowing the makers of the controversial film, who have embarked on the bus tour to shoot more footage and to promote their belief that vaccines can cause autism. No studies have ever shown that vaccines, or the ingredients in them, cause autism. Yet the belief in such a link persists among a small but vocal group of vaccine skeptics. Health officials warn that failure to vaccinate has led to outbreaks of dangerous disease, such as the numerous measles cases this year in a Somali immigrant community in Minnesota. Egan estimates he has put 7,000 miles on his Toyota Prius during his pro-vaccine travels. On the current leg of the journey, he is joined by girlfriend Sharon Schroeder, who calls herself his sidekick. Egan, who lives in Tacoma, Wash., has no medical training, but Offit said he has done a good job of educating himself about the importance of vaccines. "I think what Craig and Sharon do matters," said Offit, who agreed to meet them after being introduced through a law professor he knows who supports Egan's efforts. "I think they're brave to do it." Some of Egan's videos documenting his travels are comic, such as one in which he responds to vaccine critics who labeled him a troll. It shows him with his "Vaccines Save Lives" sign as he marches in front of the black Vaxxed bus, with narration in the style of a nature documentary. "Here we see the vaccine troll in his natural habitat," the somber voice intones. Other videos are serious, such as one in which he interviews an Idaho public health official about the importance of vaccines. He regrets one stunt, in Kansas City, when he spoke through a bullhorn outside the Vaxxed bus and urged passing motorists to honk their horns, unaware that inside the filmmakers were interviewing a woman whose child had died. "I felt like a jerk," he said. Vaxxed producer Polly Tommey said she supports Egan's right to protest but accuses him of attacking parents. "He's really attacking the wrong people," she said. And don't get her started on Offit. Tommey says her 21-year-old son suffered a seizure and developed autism as the result of the childhood vaccine for measles, mumps, and rubella, commonly known as the MMR vaccine, and points to the package insert from drug maker Merck that lists seizures among its many reported adverse events. A dangerous and incorrect conclusion, Offit countered. Just because a rare condition arose after a vaccine was administered does not mean the injection is to blame. The warning labels are written by company lawyers to cover their bases in the event of any legal challenge, just like those much-lampooned TV drug ads that seem to warn of every condition known to medicine, Offit said. The real facts can be found on vaccine information sheets from the federal Centers for Disease Control and Prevention (CDC), he said. For the MMR vaccine, the CDC says serious allergic reactions occur in less than one in a million cases. As for seizures, the agency adds: "These are so rare that it is hard to tell whether they are caused by the vaccine." Measles, on the other hand, is highly contagious and potentially fatal. Without widespread vaccination, the disease can quickly establish a foothold. Vaccine critics object when Egan, Offit, and others call them "anti-vaccine." Many have vaccinated their children and say that parents should have the right to delay or spread out the recommended shots. Also a bad idea, Offit said. That opens the door for parents to pick and choose as if the list of vaccines were a menu, which it is not. Egan likens the "delay" approach to waiting to buy car insurance. "You could wait to buy car insurance until it's too late," he said. The last time Egan and Schroeder crossed paths with the Vaxxed bus was in Dayton, Ohio, at the end of August. Now they are focusing more on supportive audiences. They plan to meet a New Mexico woman who survived the childhood scourge of polio, though she had to spend time in an iron lung. Through the use of vaccines, that disease has been eradicated in most parts of the world. Wielding his hand-lettered sign, Egan would like to keep it that way.